The final MoFi Distribution room I visited at the show featured the version of the classic BBC LS3/5A minimonitor made by Falcon Acoustics that I reported on in our report from the 2018 RMAF. This is said to be the only version currently manufactured that is truly identical to the original and was very favorably reviewed by Herb Reichert in October 2017. The Falcons were being driven by Primare’s I25 class-D integrated amplifier ($3999), which incorporates a streaming DAC and offers 100Wpc into 8 ohms. 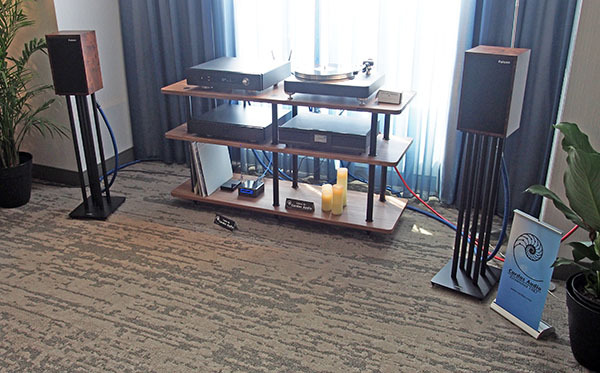 Front end was a Dr. Feickert Volare turntable ($3499 Including Origin Live Silver Mk.3 tonearm) fitted with a Koetsu Black Gold cartridge, with all-Cardas cabling, Isotek power conditioning, and Solidsteel racks and stands. I listened to a duet between Tom Waits and Crystal Gayle from, I think, the soundtrack to the Coppola movie One from the Heart and though the imaging was superb, as was the vocal quality, the problematic room acoustics took away some the magic I know these speakers can produce.